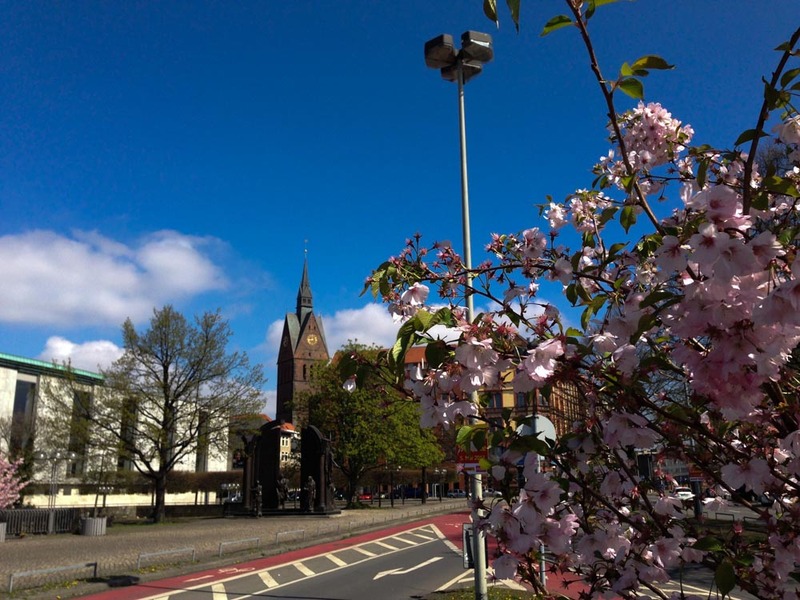 Hannover (and Minden) – Sunshine. Whimsy. Tacos. On the weekend of April 27-28, I went to Minden for a Peter Cincotti concert. It is not an exaggeration to say that I’ve been looking forward to that show more than the Depeche Mode concert in June. Seriously, if you don’t know Peter Cincotti’s music, you should really check him out. For those of you on Spotify, here’s a very brief selection of his stuff. If you don’t use Spotify- these play buttons won’t work without the software. You’ll have to check Youtube to hear some of his stuff instead. Just check him out. Go ahead. I’ll wait. 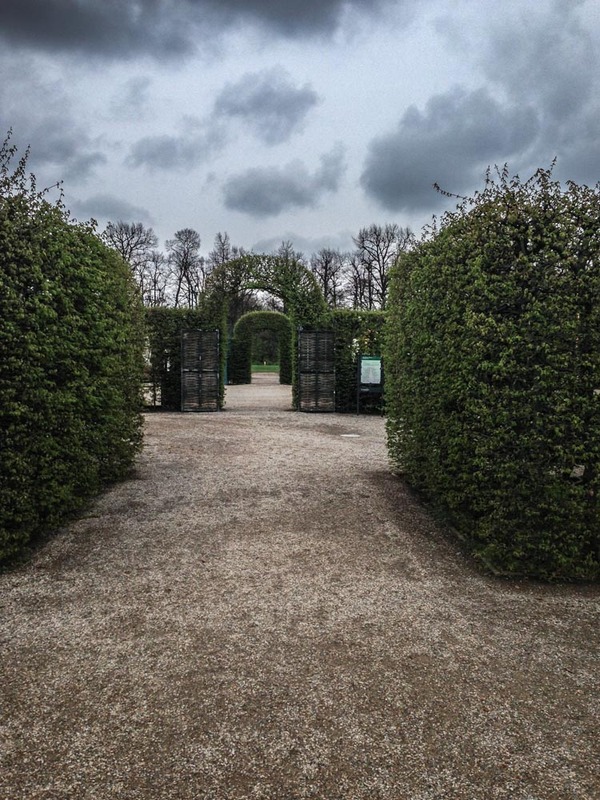 Ok, now that we’ve got the Peter Cincotti plug out of the way, I’ll talk about Hannover. 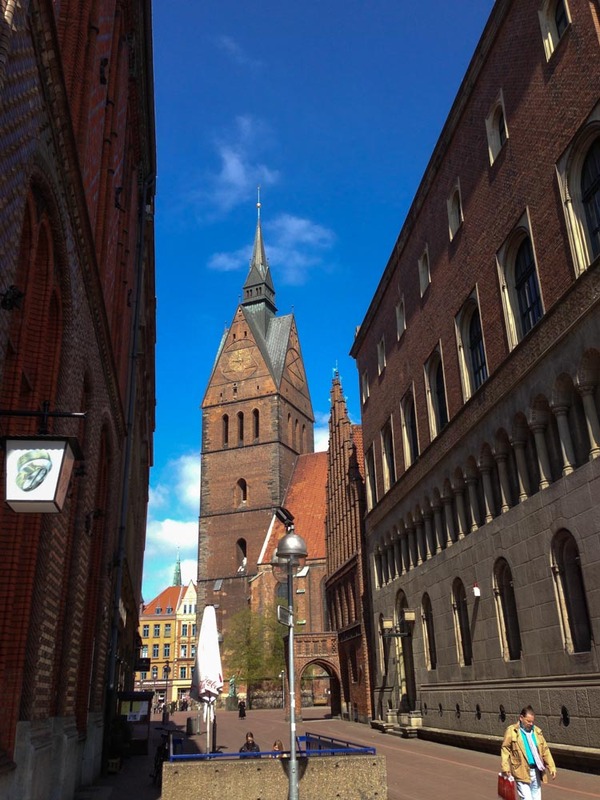 I traveled to Minden for the concert by way of Hannover, and I did some sightseeing in Hannover on Saturday before the concert and again on Sunday before my train back home. I took a pantload of pictures, and I decided to show them to you a little bit out of sequence. This isn’t exactly the order that I visited stuff, but it’s close enough. 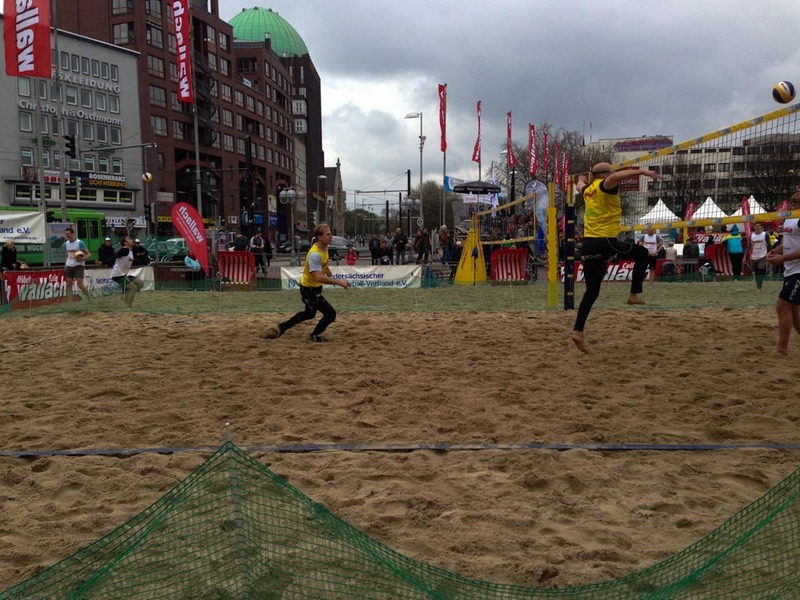 While walking near the Kröpcke, a large pedestrian area near the Bahnhof, I also stumbled across a random volleyball tournament. 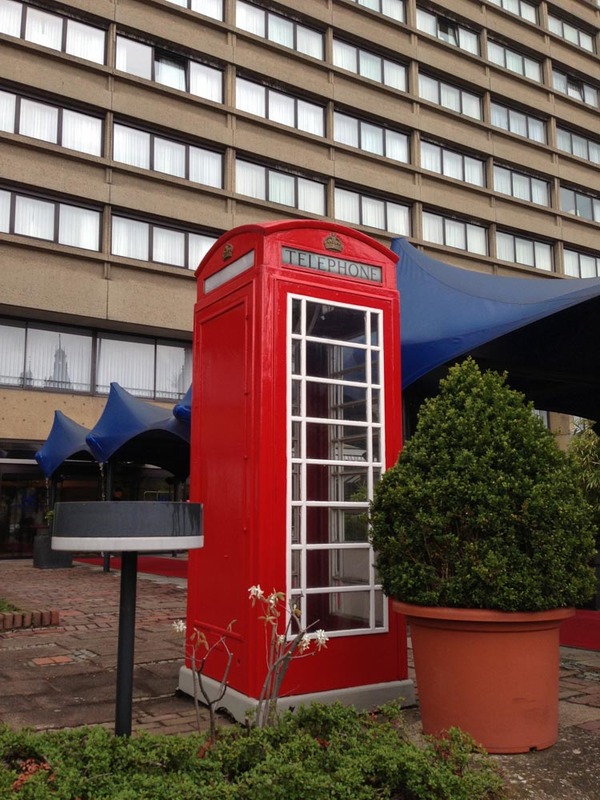 This happened last year in Amsterdam too- it was rather unexpected. I also wanted to point out this ingenious way to sell food. 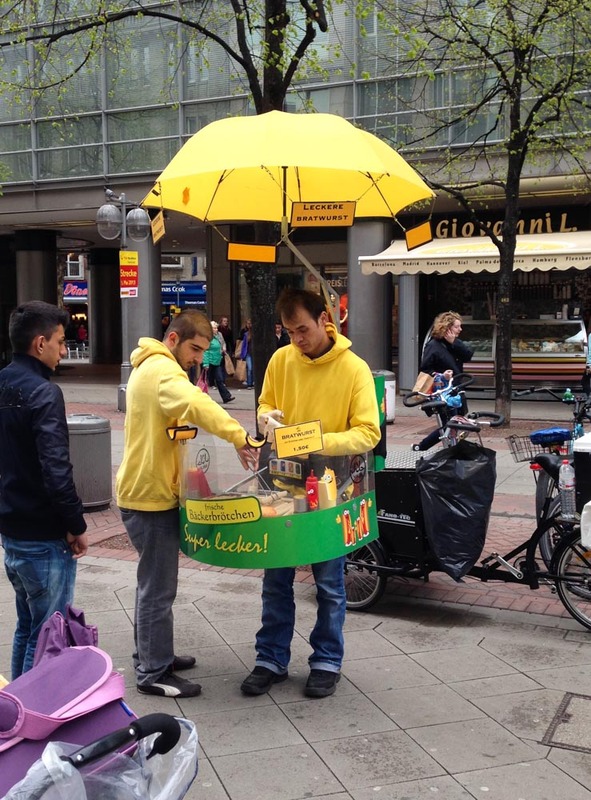 I saw one of these in Berlin a while back selling currywurst. I am consistently amazed at people’s ingenuity. Also, I kind of want one of those hands-free go-go-Gadget umbrellas. That’s really nifty! I didn’t eat lunch from this guy though, I went to Jack The Ripper’s London Tavern instead. I mostly went because I liked the name of the restaurant, but the fish and chips were pretty good.. 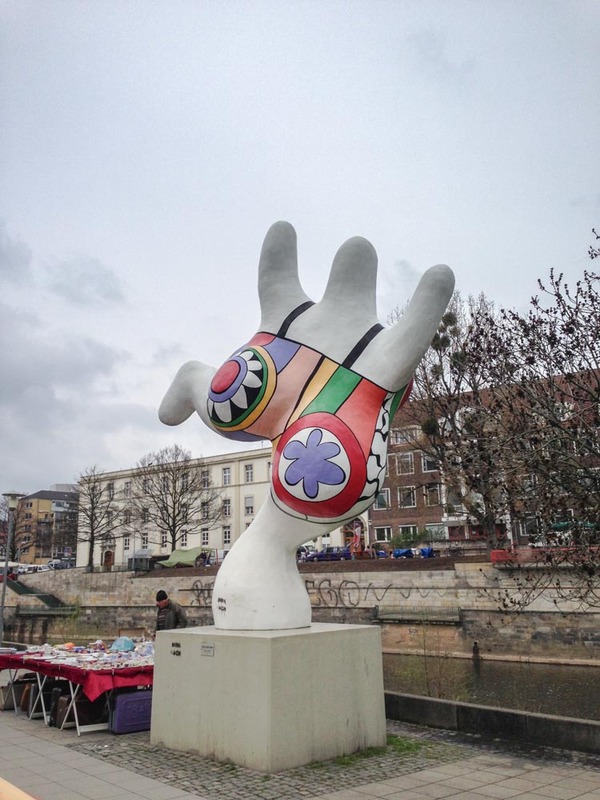 I took a walk down to the Leibnizufer to see the Nanas, large colorful sculptures by Niki de Saint Phalle. 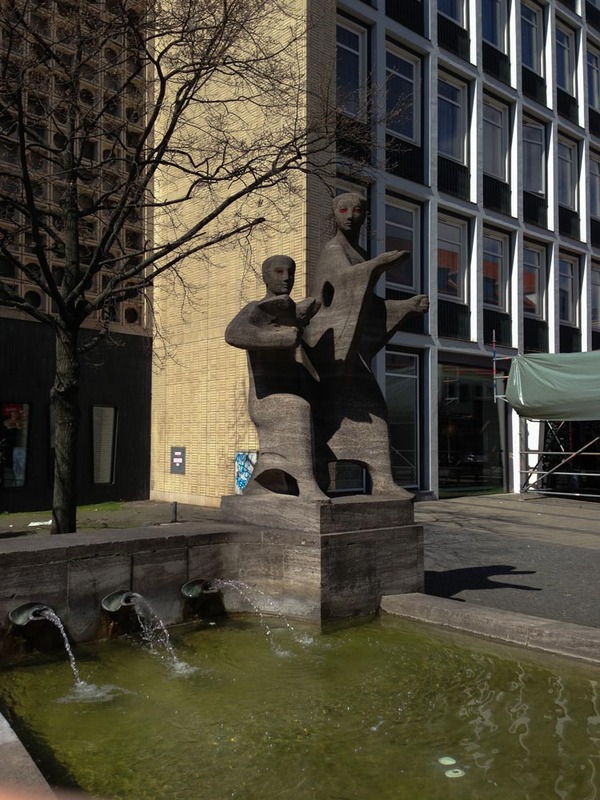 I had seen one other Nana recently, the flying protecting angel sculpture in Zurich. 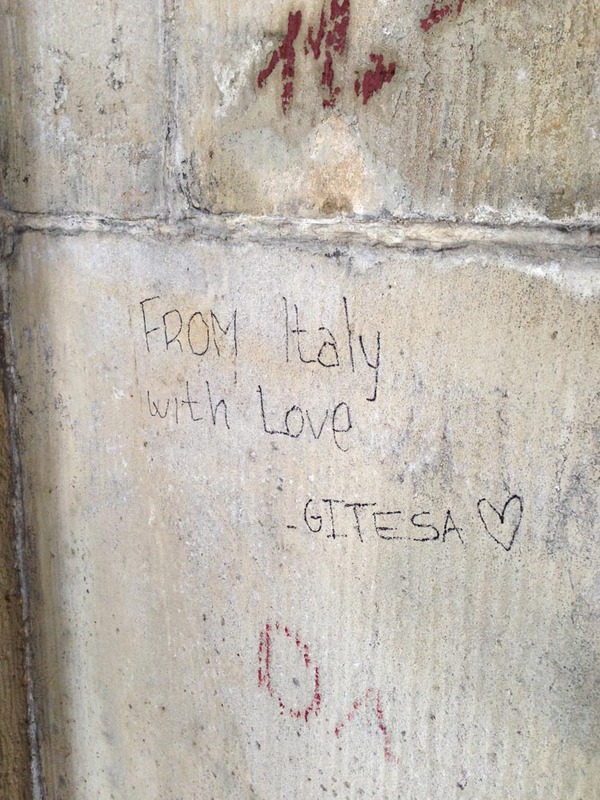 It’s the first picture in my Zurich post. 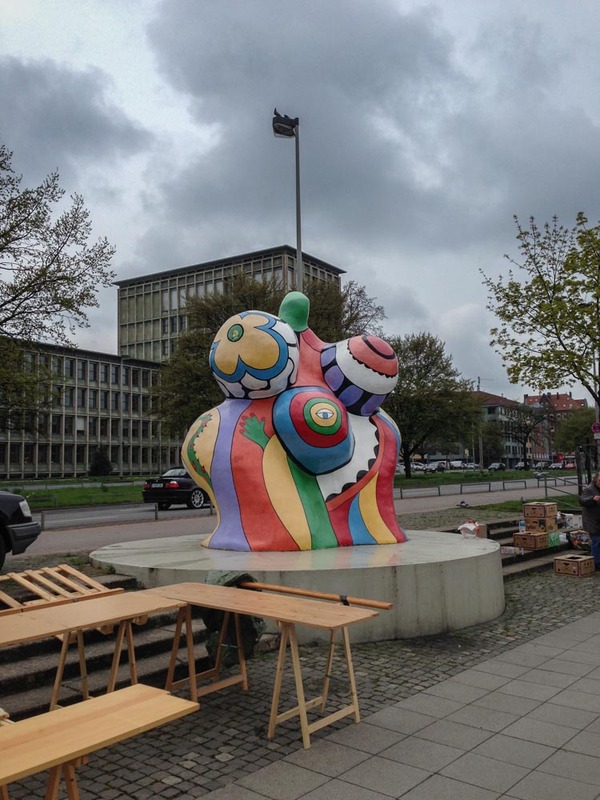 When I learned that Niki de Saint Phalle was an honorary citizen of Hannover and had donated a lot of her artwork to the city, I had to go see some. They weren’t hard to find, either. 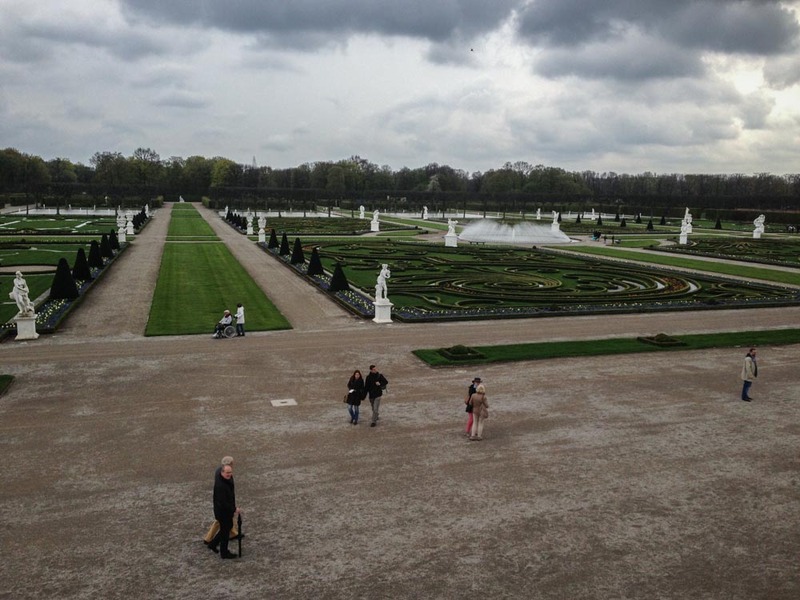 With my quest to see the Nanas a success, I decided to take the tram over to the Herrenhäuser Gärten, the Great Garden of Herrenhausen. It was absolutely enormous, and I could easily dedicate several hours to walking around on a warmer, sunnier, more flowerific day. 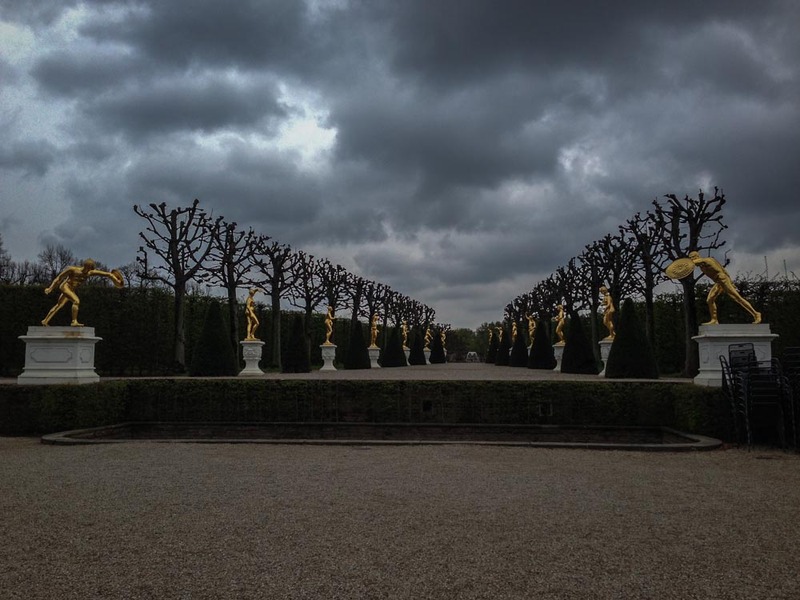 That Saturday was cold and overcast, but it was still an amazing place. 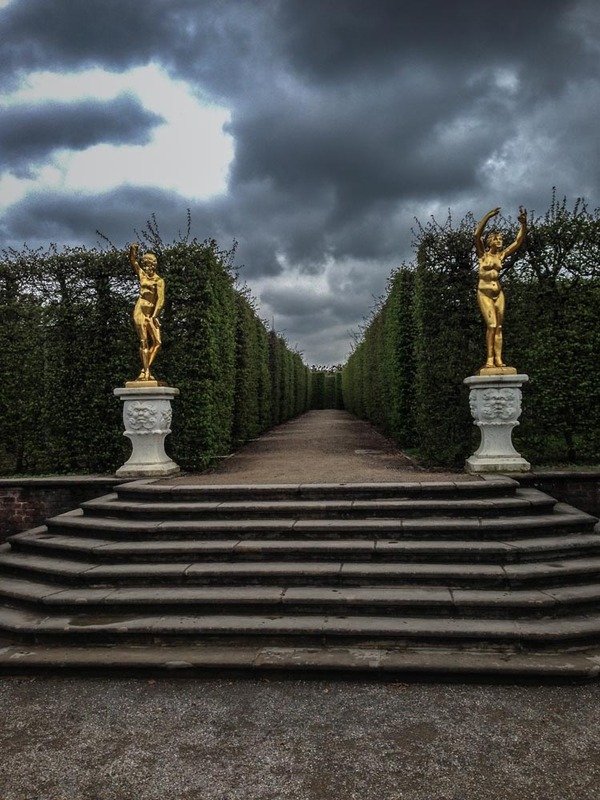 I wandered around for nearly two hours. 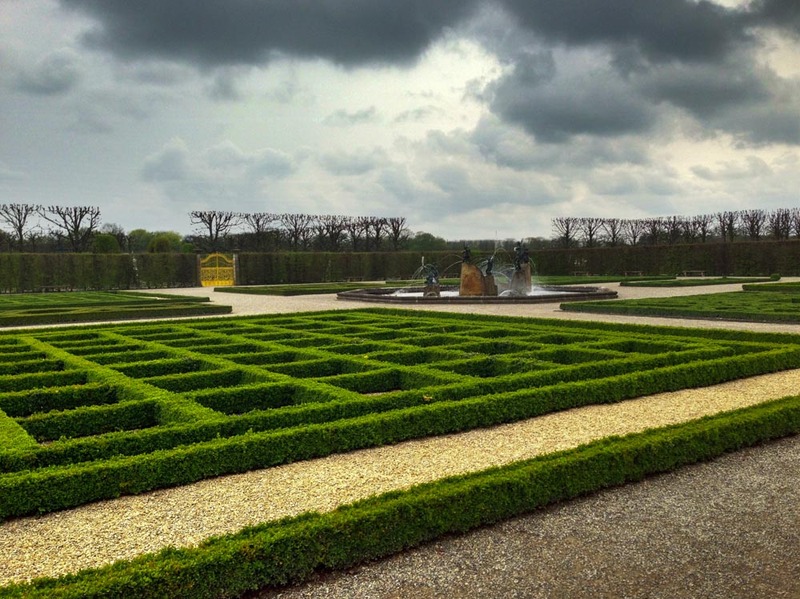 Here are eight of the many, many photographs I took at Herrenhausen. 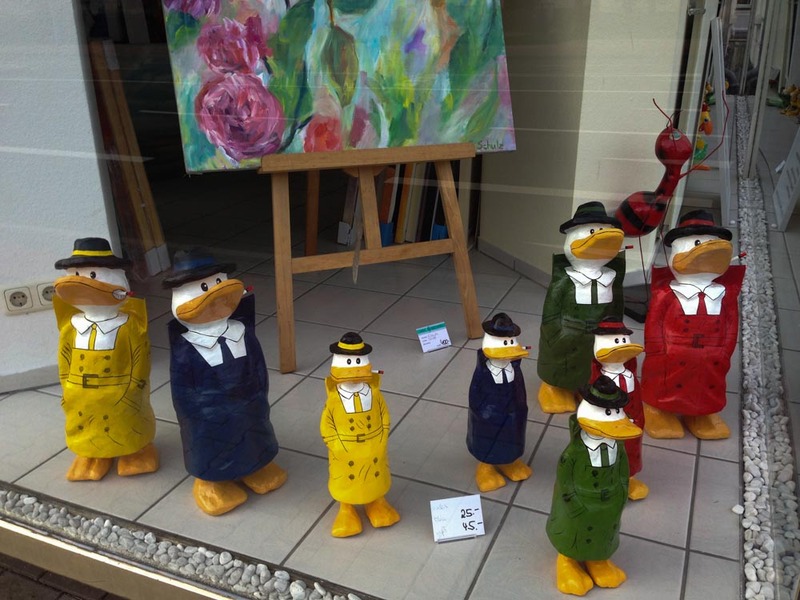 We interrupt this post about Hannover to show you a picture from an art gallery window in Minden. I really, really like the duck detectives, but I have no idea why. Also, the supplicant ant in the background cracks me up. If I ever go back to Minden when this place is open, I am totally buying one of the ducks though. 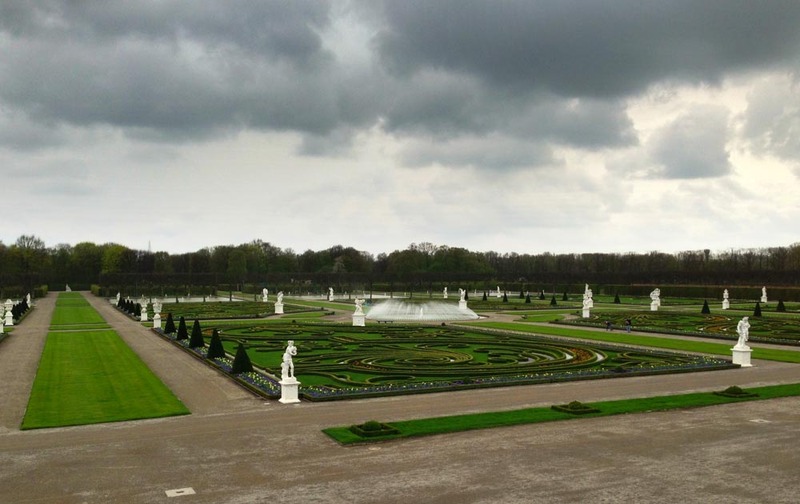 Meanwhile, back in Hannover, the weather cleared up a great deal. Sunday wasn’t any warmer than Saturday, but at least the sun came out. This means that the sky got bluer and the pictures got prettier. 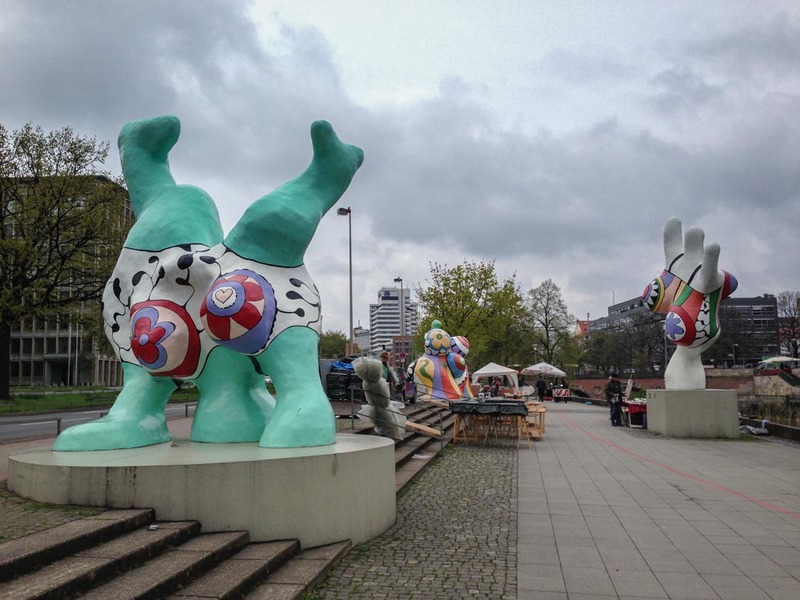 Hannover has a lot of interesting sculptures. 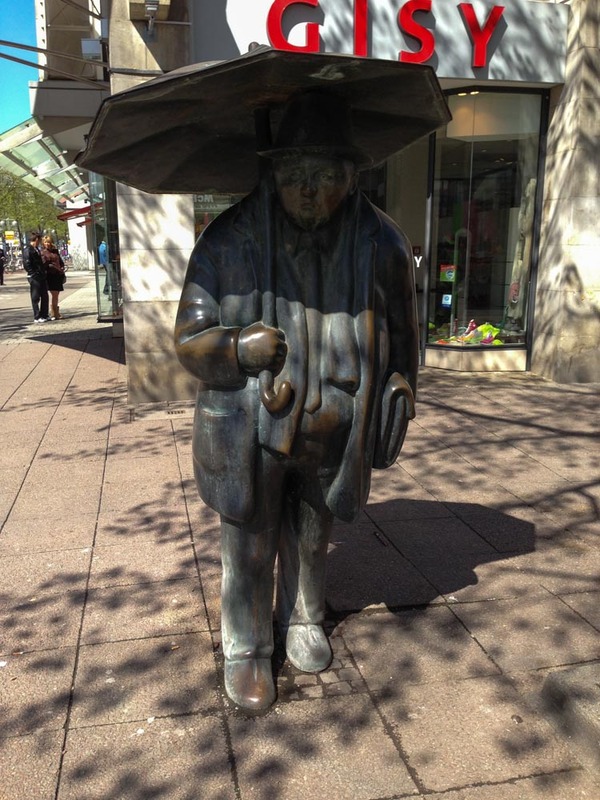 I find sculptures and statues that I like in every city I visit, but Hannover has a larger than average share of really neat ones. 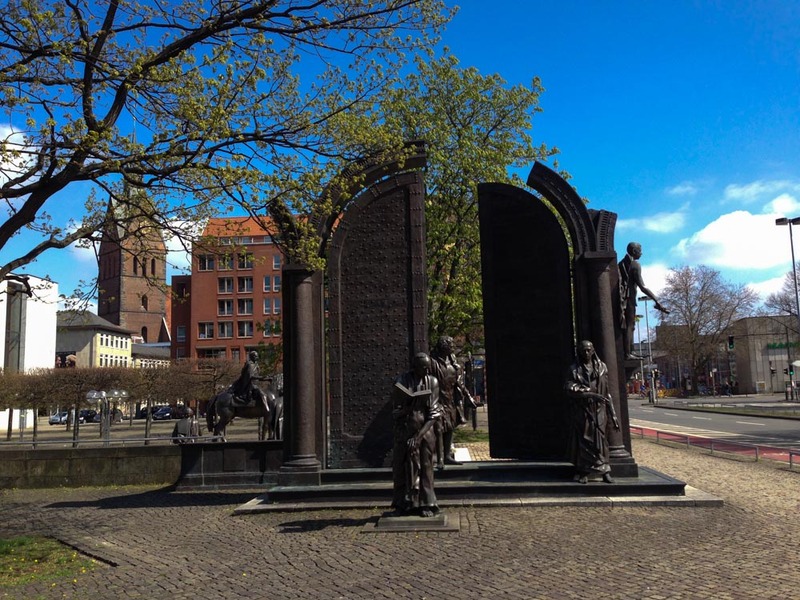 This giant gate and the caesar-looking dude on the horse are both standing at an intersection not terribly far from the Neues Rathaus, which I’ll get to a little further down in this post. This glum fellow with the umbrella is standing not far away from a glum looking woman holding an umbrella. I really want to know the story behind this one. Someone gave these two very red eyes. It makes them look really creepy. I’m just sayin’. 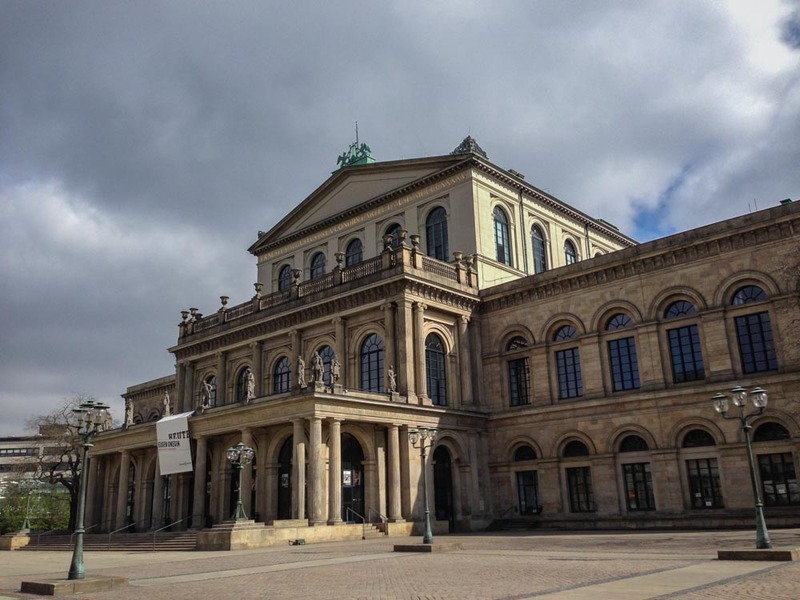 Hannover has a nice looking opera house. I know nothing further about this building. It sure is cool looking though. 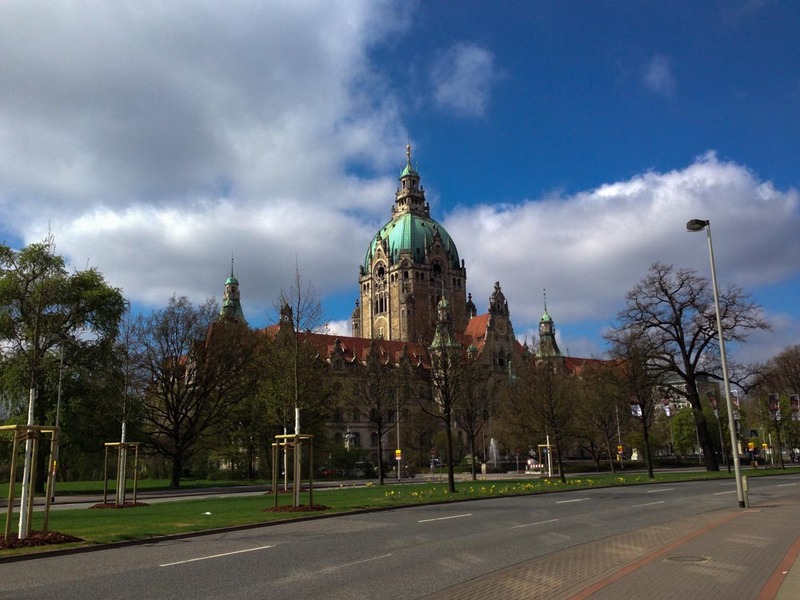 One of the highlights of my trip to Hannover was the Neues Rathaus, the old “New Town Hall.” The building is no longer used for the main city administration, but it’s still got some offices in it. More importantly, you can walk around inside and go up inside the dome for a small fee. You know me and tall places, how could I not climb up? The first part of the “climb” is actually an elevator to a small stairway to… another elevator. 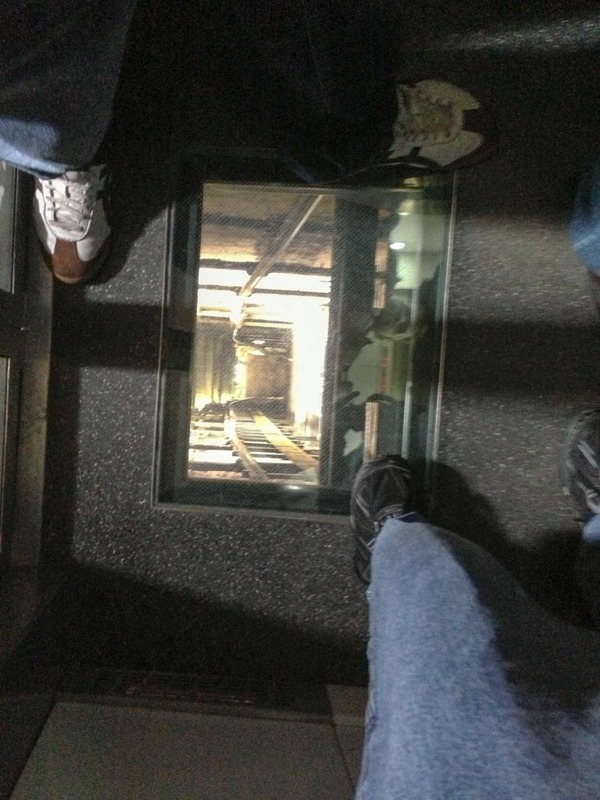 This elevator does most of the vertical ascent, but there are glass panels in the floor and ceiling to show you the shaft as you travel. 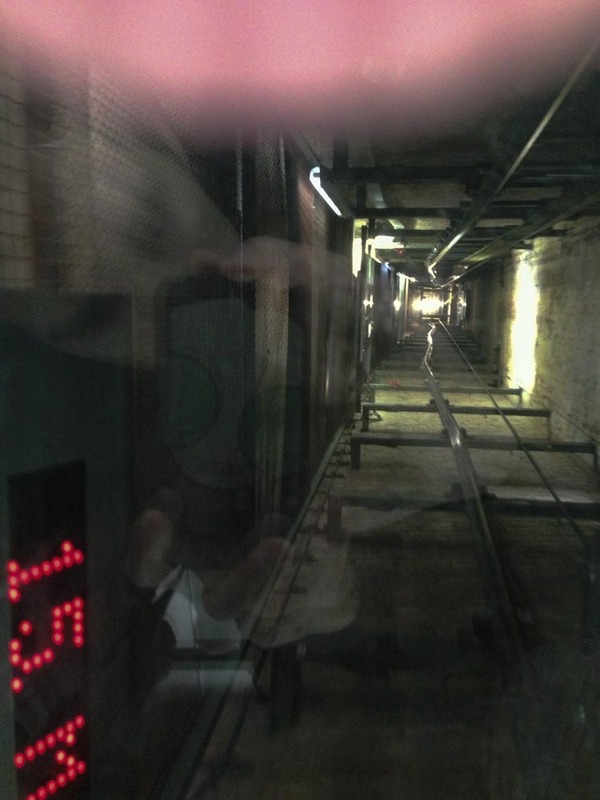 The next picture is looking up and the following picture is looking down the elevator shaft. This is not for the claustrophobic, agoraphobic, or acrophobic. 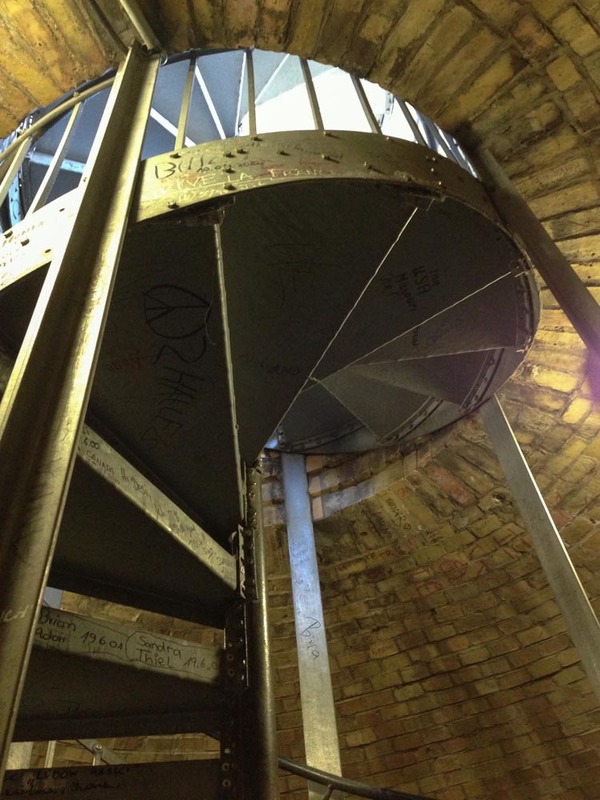 At the top of the elevator, there is a chamber filled with decades of “Francisco was here, 1988!” styled graffiti, as well as a metal spiral staircase to get you to the upper levels of the observation dome. The view from the observation level at the top of the stairs is amazing if you’re there on a clear day. After visiting the dome, I walked around the inside of the building for a while. 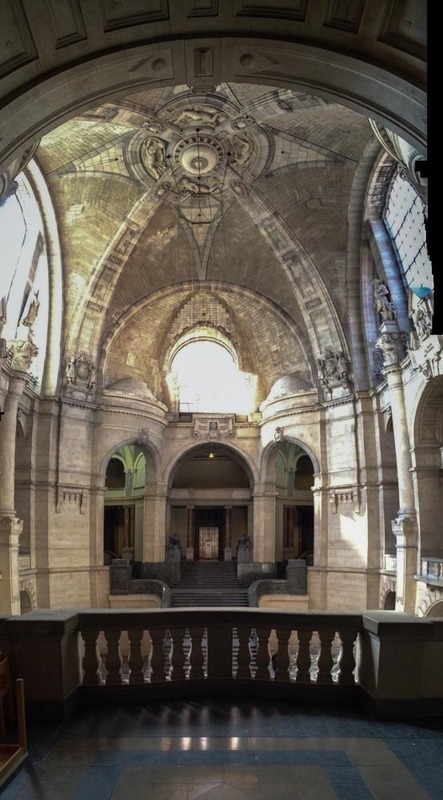 The grand staircase and the ceiling in the center chamber are amazing. 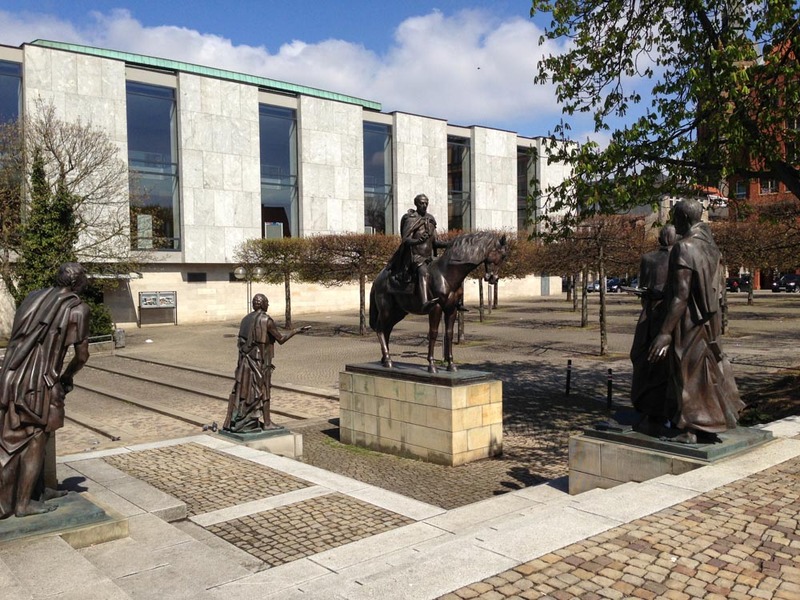 There are also a variety of models of the city of Hannover in various times. 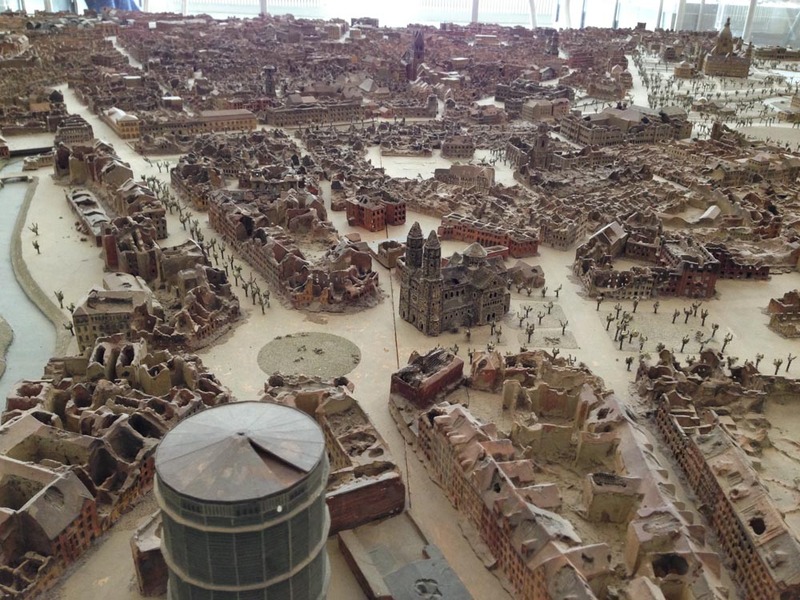 This one shows how bombed out the city was in 1945, which is really fascinating to see. Segway tour! I saw these guys as I was walking around the Rathaus. 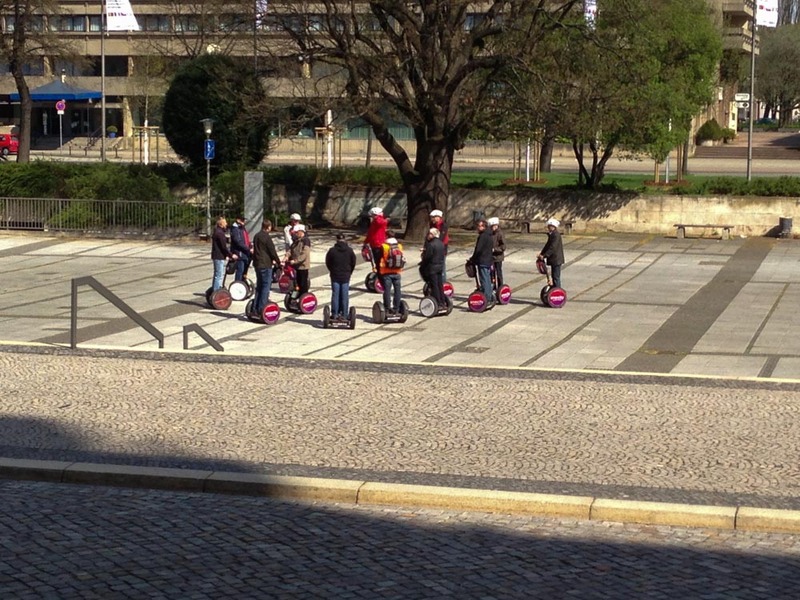 I’ve always wanted to go on a Segway tour. 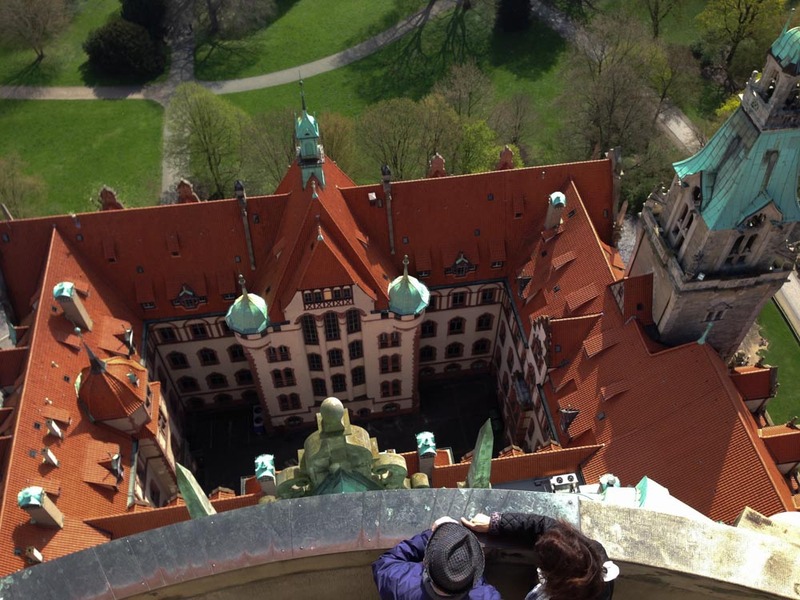 This is the view from the water’s edge behind the Rathaus. There’s a cafe right there- if I’d been hungry when I was at the Rathaus, I can’t think of a nicer place to sit and eat. Lastly, this building… I’m not actually sure what it was. I assume it’s a church of some sort. It was just neat looking, so I snapped some pictures of it. 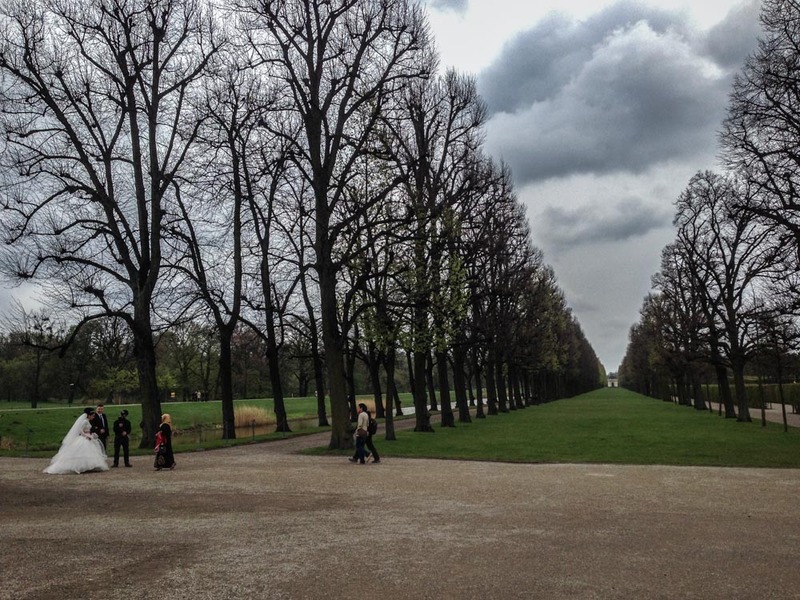 Have you ever been to Hannover? 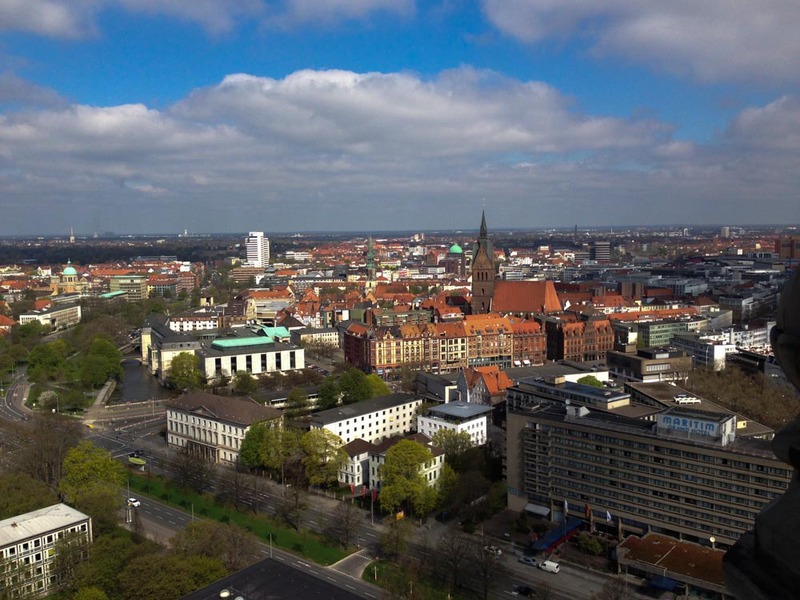 Our first day trip after we moved to Bielefeld was to go to Hannover. I remember seeing guys selling bratwurst from those little carry-along stands!The Rathaus is stunning, especially since you can see the damage from where it was bombed and rebuilt. And of course the models of the city throughout the years really drove home the history of the country as a whole. Wow, the place is beautiful. I love those little duck detectives! They’re so cute, aren’t they?